Green design solutions are becoming ever more popular these days the more people take responsibility for their impact on the Earth's biosphere, but “going green” as a word usually elicits mixed responses from different people. So what is biophilic design? It is something which has been used by humans in their construction and architectural efforts throughout the millennia, however the term itself dates back to 1984, when Edward O. Wilson first introduced the term in his eponymous book “Biophilia”. Biophilic design, put simply is the practice of adapting a home to the environment, rather than the other way around. Its application however goes far beyond the simple harmony with our environment, but also to a more subtle psychological level as well. After all the true meaning of biophilic is the love of nature and other life forms we experience throughout our lives. Much of today's stress in our lives comes from many different sources, however our environment at home or at work has a profound impact as well. There is a reason why green spaces surrounding hospitals promote a faster recovery, as was witnessed in the research of Doctor Roger S. Ulrich of the Chalmers University of Technology in Sweden. The benefits of this type of design are something you yourself may have experienced at one time or another in different buildings. The sterile and cold feel of most modern construction certainly may look beautiful, however it is the earthy colors and richness of plant life of biophilic design that bring a smile to our faces. 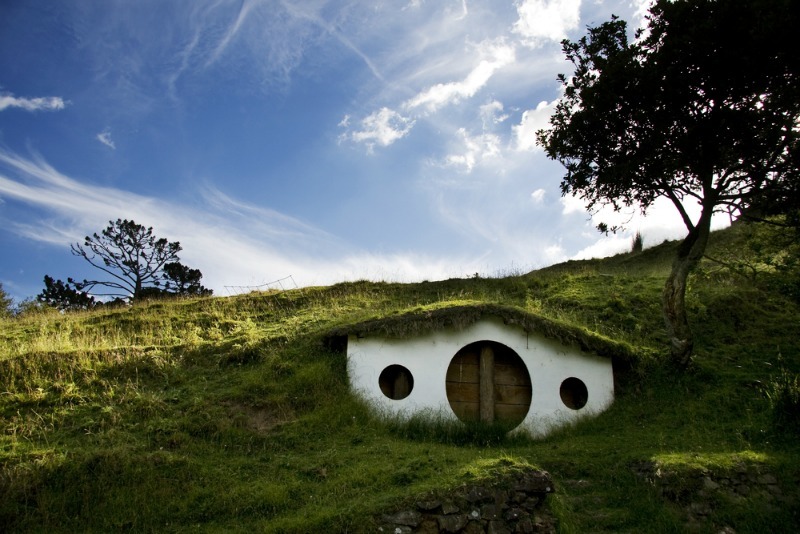 After all, would you rather live in a bunker or a warm and sunny home surrounded by a forest and running water? That being said, this type of design can be achieved in a number of ways. Construction from materials commonly found in nature, such as log cabins, in term combined with even more natural elements for roofing, floors and other aspects of a home or building are one of the most common ways of approaching this solution, however there are other ways. 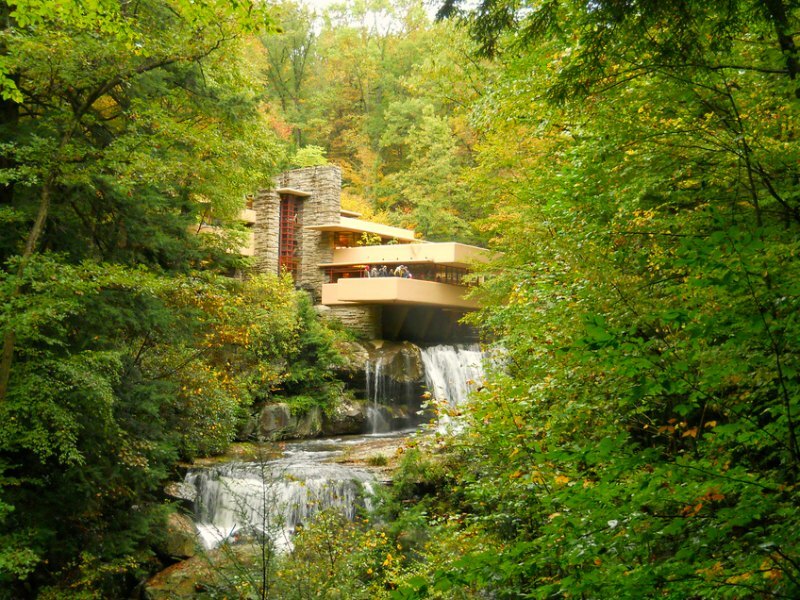 The American architect Frank Lloyd Wright worked on a great number of homes and buildings around the United States, however one of his works can truly be considered a wonderful example of biophilic design using modern construction methods: Fallingwater. Given as an example here, this home located in the southwestern parts of Pennsylvania was built at the tip of a waterfall, combining its waters and their natural beauty with the surrounding forest. Much like traditional Japanese architecture, this particular home combined the connection with the surrounding natural environment and the modern construction used. Although this example is a rather extreme one considering its unorthodox construction location, the harmonious link between nature and man-made building is more than obvious. The running water of a stream can be channeled through a property instead of being led away or used, trees surrounding a home can be adapted to keeping it cool during the summer months because of their shade and so on. Though these are common sense, many modern buildings completely avoid that link and thus contribute to a more sterile image, far removed from the natural world. In the end, biophilic design can be used in a variety of ways to make offices, homes and other buildings and properties adapt to the natural world around us, both reducing our impact on the environment and creating a relaxing location that promotes positive feelings inside us. The reduction of stress levels is something many of us strive toward in today's hectic business world and biophilic architecture is an excellent way of keeping ourselves calm and focused through the colors and shapes of our work space or home.